The grill's intense heat is a lot like a restaurant pizza oven. Keep all your toppings light and cook them beforehand so they heat evenly on the grill. Lightly brush the crust with oil and sear both sides on the grill. Next, add the toppings and cover the grill. Cook about 3-7 minutes. 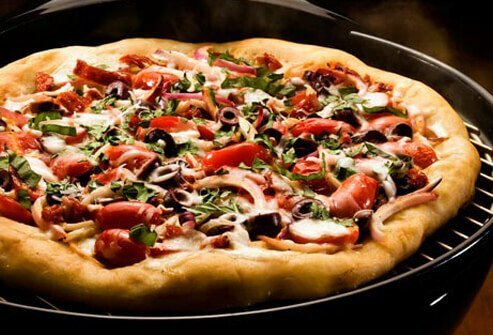 Every minute, rotate the pizza 90 degrees to prevent burning. Whole-wheat crusts are healthier -- some recipes are specially made for grilling. 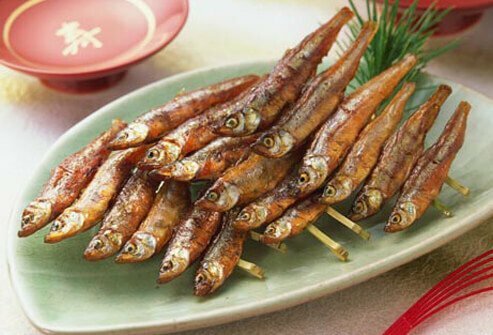 Skewers are great for cooking whole small fish like fresh sardines, which are loaded with heart-healthy fats. You can easily grill several fish at once. Insert one skewer through each fish near the base of the head. Insert a second skewer near the tail. That holds the fish firmly in place, so they're easy to turn. Brush them and the rack lightly with olive oil and cook the fish, turning once, just until they flake easily. Grilling intensifies the sweetness of strawberries, peaches, pineapples, bananas, apples, pears, and other fruit. 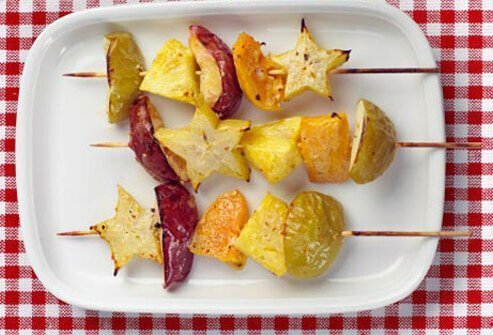 Cut fruit into pieces and spear them on skewers. Or wrap the pieces in foil. The trick is to cook with indirect heat. Turn down the gas or place the fruit on the edges of the grate. Cook the fruit only for a few minutes. Grill on low heat until it is hot and slightly golden. Kebabs make fun finger food out of any meal, even dessert. Kids love the idea of food on a stick, so let them build their own. 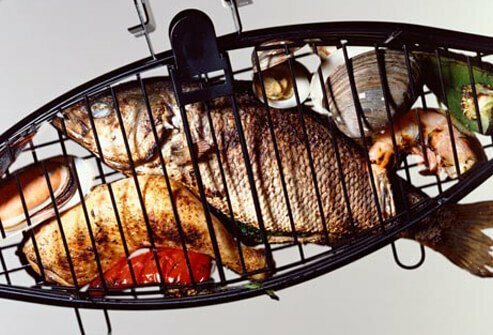 For safety, grill meat or fish, vegetables, and fruits on separate skewers. Bite-size chunks of tomatoes, zucchini, peppers, mushrooms, and onions are a good veggie combination. 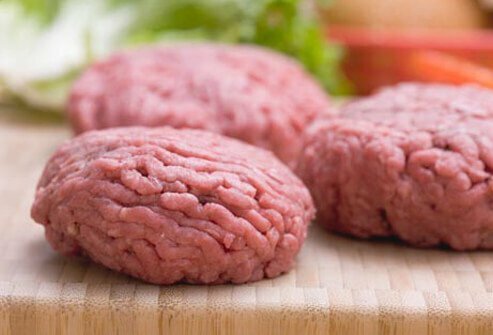 Thinner burgers are healthier burgers because they cook faster. Grill 1/2- to 3/4-inch patties over medium heat. They'll stay juicy if you don't smash them on the grill with a spatula, which forces the juices out. Add some chopped bell pepper, carrot, onion, or barbecue sauce for a juicier turkey burger. Prepared veggie burgers may crumble less than homemade ones. Other meatless meaties: juicy portabella mushrooms and marinated tofu. Salmon is almost a grilling tradition -- it cooks well on the grill because its oils keep it moist and help prevent sticking. For medium-rare fillets, cook them about 4 minutes on each side. 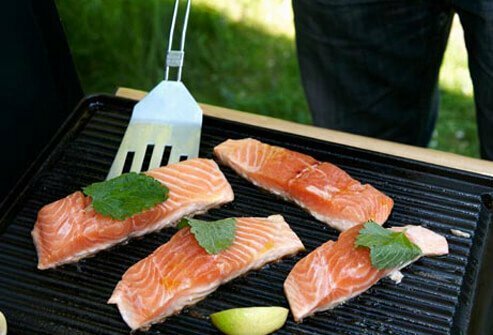 Besides salmon, the best fish to grill are ones that can be cut thickly and cooked with the skin. Consider halibut, tuna, trout, and swordfish. 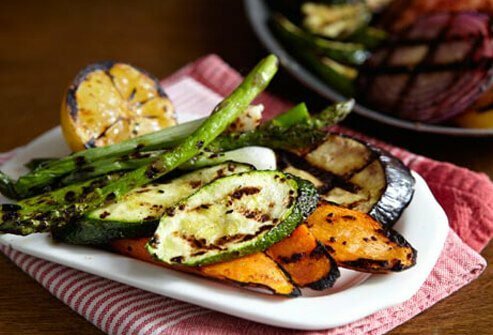 You can grill small foods like eggplant slices, mushrooms, or flaky fish in a hinged grilling basket or foil packet, which holds the food firmly and is easy to turn over. Or choose a plank: Grilling small or delicate morsels on a wooden plank keeps them from falling apart (or through the grates). And it also infuses a light, smoky woodiness to foods, from prawns to figs. Follow instructions that come with your plank for pre-soaking and heating. Foods like flank steak were made for marinade. 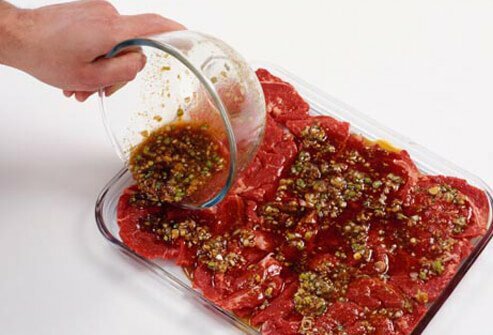 Marinating adds flavor and helps tenderize lean meats, so you get top-notch flavor without the high price and fat. 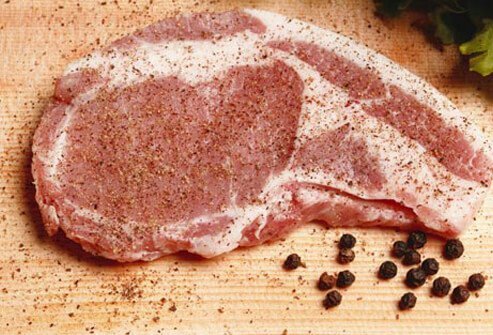 And marinating meats before grilling may reduce the cancer risks of heterocyclic amines (HCAs). Marinade recipes may include soy sauce, brown sugar, honey, olive oil, garlic, spices, wine, vinegar, or citrus juices. Marinate in the refrigerator and drain the meat before grilling. Use the marinade to baste the meat on the grill. Dry rubs are a mouth-watering alternative to heavy sauces. They pack lots of flavor for few calories. You can pat them on food just before grilling. Buy a low-sodium rub with less than 5 grams of sugar per serving. Or make your own custom rub. Try these for salmon or steak: paprika, pepper, and chili powder; or chili peppers, garlic, and cilantro. For chicken or white fish: oregano, thyme, pepper, coriander, and garlic or onion. Where there's rich, aromatic smoke, there's tasty, succulent meat. Smoking -- which is slow-cooking with indirect heat -- is often preferred for large cuts like briskets and pork loin, and whole turkeys or chickens..
Use a covered grill if you don't have a smoker. Put a pan of water under the grate between two piles of coals. Center the food over the pan. For the best smoke flavor, use beech, oak, hickory, apple, or maple wood. To add interesting new flavors into grilled foods, use mesquite or hickory chips in your grill. Other hardwoods that add a unique taste include pecan, oak, maple, and apple wood. Soak the chips in water, wine, or apple juice for an hour. Put them on top of the coals, or for gas grills, wrap them in a foil pouch and punch several small holes in it. Put it beneath the gas grill grate or near the flame of a propane grill or on its grate. 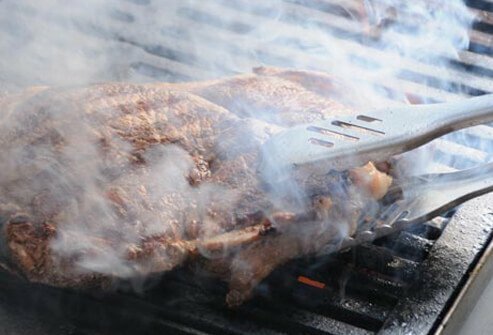 Cook small, lean pieces of meat, which take less time on the grill and produce less smoke from dripping fat. If you use a charcoal grill, center the food on the grate but push the coals to one side. Remove visible fat to prevent flare-ups. 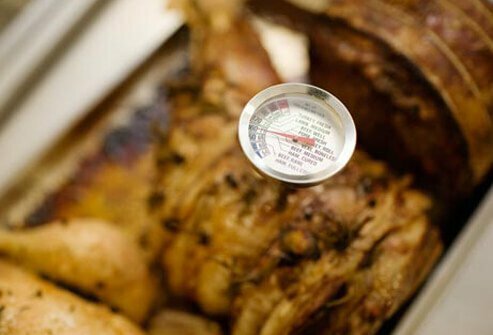 Partially cooking meat in the oven, microwave, or on the stove can reduce grilling time and HCAs. Microwaving meat for 2 minutes before grilling releases some of its juices. 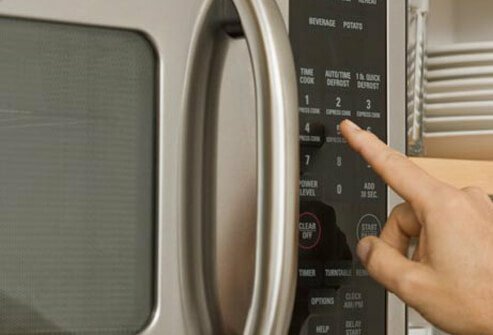 Some research suggests that if you throw away those juices after microwaving, you may reduce 90% of HCAs. 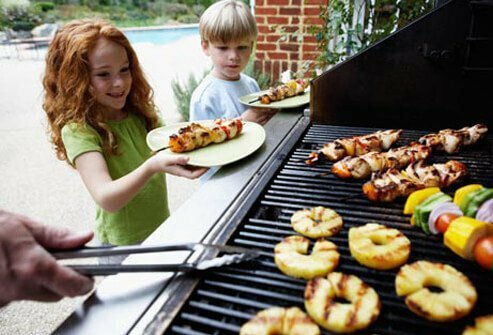 A hot tip: Always grill foods on a preheated grill immediately after precooking to prevent harmful bacteria from forming. Instead of a baked potato with toppings, eat grilled sweet potatoes. Instead of potato salad, eat coleslaw with light dressing. Instead of iceberg lettuce with ranch dressing, eat sliced tomatoes and avocado drizzled with olive oil and vinegar. 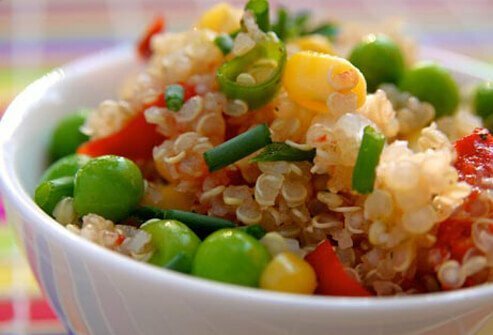 Instead of pasta salad, eat a whole grain medley salad with beans or quinoa. To prevent food from sticking to the grill, clean the grates thoroughly with a wire brush and hot, soapy water before cooking. It may be easier to remove leftover grease by preheating the grill. 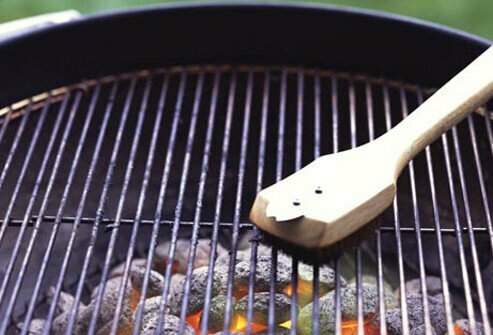 Once the grate is clean, let it heat up completely before cooking -- 20 to 30 minutes for a gas grill. 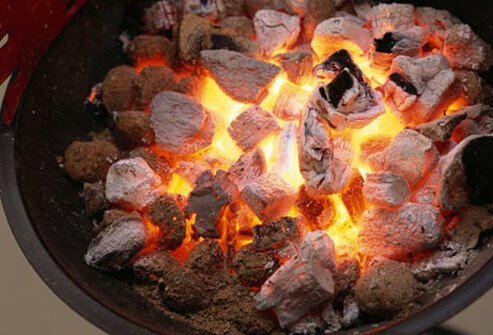 Preheat a charcoal grill about as long, until the coals are lightly coated with ash. 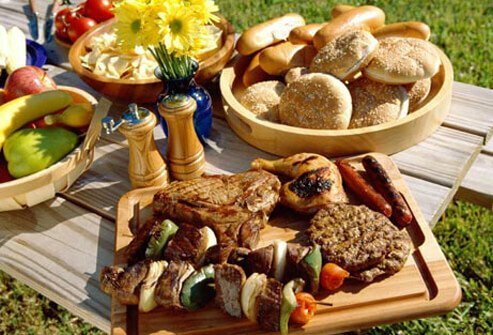 Keep all food on ice or refrigerated until it reaches the grill. Wash your hands and all your cooking utensils in warm, soapy water before you start to cook. Put cooked food on a clean platter, not the one you used for the raw food. Cook foods thoroughly. Don't partially grill foods to finish cooking later. After you remove meat or poultry from the grill, let it sit for 5 minutes. The juices will settle as the temperature evens out. 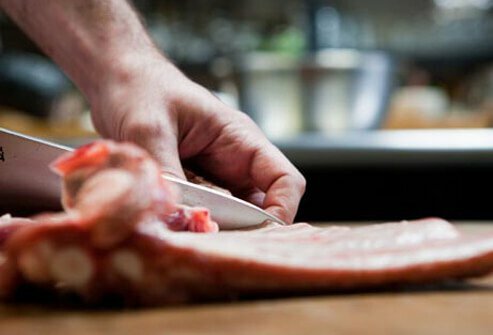 Because resting prevents the juices from leaking out, the meat will be more moist and tender. American Heart Association: "Fish 101." 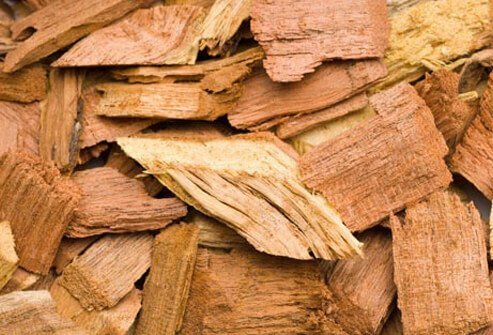 Antoine Hardwoods: "How to Cook with Wood Chips and Chunks." Antony, M. Indian Journal of Experimental Biology, November 2011; vol 49: pp 805-16. Bosetti, C. Annals of Oncology (online edition), February 2012. Center for Science in the Public Interest, Nutrition Action Health Letter. EatingWell.com. 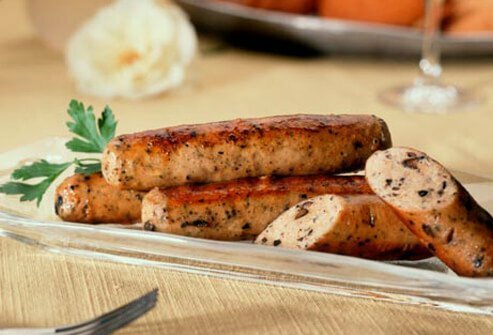 "Healthy Hot Dog Recipes & Healthy Hamburger Recipes." Food Network Good Eats: "Dis-Kabob-Ulated." Food Network Healthy Eats: "Make Your Own Spice Rubs." Harvard School of Public Health, The Nutrition Source. Kamen, David, chef/instructor, Culinary Institute of America: 845-451-1386. Lang, J., editor. Larousse Gastronomique, Crown Publishers, 1998. New York Times Fitness & Nutrition: "Turkey and Vegetable Burgers." Northwest Tripfinder: "S'mores Variations: Mixing It Up Around the Campfire." Partnership for Food Safety Education. Peterson, J. Fish and Seafood: The Cook's Indispensable Companion, William Morrow and Company, Inc. 1996, pp 53-4. U.S. Department of Agriculture. "Smoking Meat and Poultry." Willan, Anne. The Country Cooking of France, Chronicle Books, 2007.